Former Carlisle United player-coach Paul Thirlwell has mixed feelings about his future following his release by the League Two club this summer. 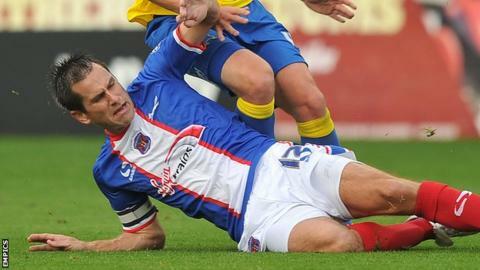 The 36-year-old, who captained the Cumbrians to the 2011 Johnstone's Paint Trophy, ended an eight-and-a-half-year association when his contract was not renewed by manager Keith Curle. "It is exciting and you don't know what's round the corner," he said. "However, it's tinged with a bit of sadness as to what you're leaving." The Washington-born midfielder, who had spells at Sunderland, Sheffield United and Derby before the move to Brunton Park, made 248 appearances for Carlisle. He took over the captaincy from Kevin Gray in 2007 and played under five different managers, but is yet to confirm his future away from the club. "It does feel strange as you become accustomed to doing the same things," Thirlwell told BBC Radio Cumbria. "I had eight and a half years which is a long time and I thoroughly enjoyed my time there."